Fixed critical bug for iOS8 that was causing app to crash at start. Published: 2013-07-19, by Ana Gracia. "He was a skater boy..."
Stickman Skater is a really addictive and simple platformer in which your put yourself in the shoes of a skater and need to help him get as far as possible. The design is simple but effective and we were surprised at how entertaining and challenging this game was, even since the beginning. 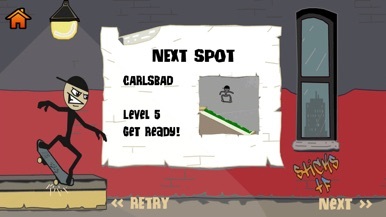 Your task consist of avoiding the obstacles and doing tricks in order to get a higher score and level up. As for the controls, you can push the left button to increase speed and the right button to do tricks. If you're in the advanced mode, on the other hand, swipe while being on air to do combos, depending on the direction. 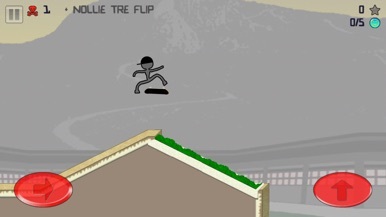 TRACTION GAMES is the developer of Stickman Skater and other similar games with the same main character. An excellent entertainment with two game modes and many tricks to do. Ranked #2 paid apps USA, Ranked #1 Sports game in 15 countries. You are a little stickman skater just trying to make a name for himself by throwing down the biggest tricks at all the famous locations including Dogtown, Love Park, Carlsbad, Hollywood, Tampa and Wilshire. Do you have what it takes to turn pro and score that elusive skate mag cover photo? * Easy to pickup, hard to master! * Over 1000 different trick combinations possible. If you're a fan of skating games or sidescrolling games like canabalt, then you should check this game out. The two control methods are nice, the animation is fluid, and the gameplay is addictive. If you haven't seen the video, basically gameplay involves skating through various areas, pulling off tricks and picking up tokens for points. There is plenty of challenge in the game, so those 24 levels should keep you occupied for a while. Definitely one not to pass up. Choose your preferred control mode and don't let the stickman die. Stickman Skater is a really addictive and simple platformer in which your put yourself in the shoes of a skater and need to help him get as far as possible. The design is simple but effective and we were surprised at how entertaining and challenging this game was, even since the beg….